Blue Horizon, a private Key West oasis with a large pool. In the Casa Marina East neighborhood is a unique two-story, four-bedroom home with two living areas and two bedrooms on each level. 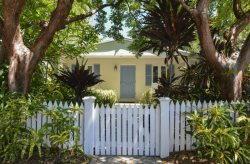 Beautifully furnished and conveniently located just three blocks from Higgs Beach and 3 houses from White Street. This home is a great place to stay while you are in America's Paradise with more than enough space for all. The pool deck may be directly accessed via the upstairs or downstairs balcony. The entire pool area of is very private and surrounded by a six-foot high fence and lush greenery. There are chaises and an outdoor dining table that seats eight as well as a gas BBQ. You'll also have an outdoor shower so you can rinse off after swimming a few laps.